Prayer is the vital element of the Fellowship of the Least Coin (FLC) ecumenical prayer movement. 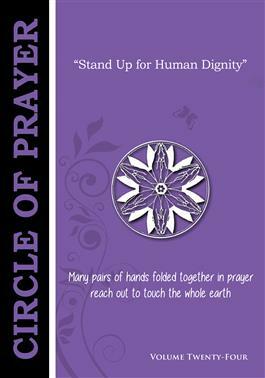 That’s why a booklet of prayer, “Circle of Prayer,” is made available every two years as prayer is offered and a least coin is set aside. (“Least” coins are collected and fund projects around the world.) Each volume, published by the International Committee for the FLC, includes twenty-four meditations and prayers written by women around the world. The theme of volume 24 is “Stand Up for Human Dignity.” Volume 23 and 22 are also available.